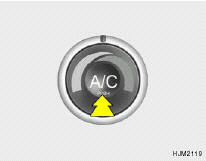 To use the air conditioning to cool the interior: o Set the side vent control to "OFF", to shut off outside air entry. o Turn on the fan control switch. o Turn on the air conditioning switch by pushing the switch. The air conditioning indicator light should come on at the same time. o Set the air intake control to "Fresh" mode ( ). o Set the temperature control to "Cool". ("Cool" provides maximum cooling. The temperature may be moderated by moving the control toward "Warm".). o Adjust the fan control to the desired speed. For greater cooling, turn the fan control to one of the higher speeds or temporarily select the "Recirculation ( )" position on the air intake control. For dehumidified heating: o Turn on the fan control switch. o Turn on the air conditioning switch. The air conditioning indicator light should come on at the same time. o Set the air intake control to the "Fresh" mode ( ). o Set the air flow control to the "Face" ( ). o Adjust the fan control to the desired speed. o For more rapid action, set the fan at one of the higher speeds. o Adjust the temperature control to provide the desired amount of warmth. o If the interior of the car is hot when you first get in, open the windows for a few minutes to expel the hot air. o When you are using the air conditioning system, keep all windows closed to keep hot air out. o When moving slowly, as in heavy traffic, shift to a lower gear. This increases engine speed, which in turn increases the speed of the air conditioning compressor. 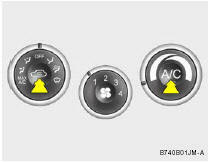 o On steep grades, turn the air conditioning off to avoid the possibility of the engine overheating. o During winter months or in periods when the air conditioning is not used regularly, run the air conditioning once every month for a few minutes. This will help circulate the lubricants and keep your system in peak operating condition. To remove interior fog on the windshield: o Set the air flow control to the defrost ( ) position. (The A/C will be turned on automatically and "Fresh" mode will be activated.) o Set the temperature control to the desired position. o Set the fan speed control between "1" and "4" position. NOTE: When the A/C is operated continuously on the floor-defrost level ( ) or defrost level ( ), it may cause fog to form on the exterior windshield because of the temperature difference. At this time set the air flow control to the face level position ( ) and fan speed control to the low position.